Associate Professor Kneebone has 16 years of Prostate Cancer expertise, which he has developed at Northern Sydney Cancer Care Centre, and previously at Liverpool Cancer Centre. He is a strong devotee to providing his prostate cancer patients with a very friendly, caring and honest relationship throughout their prostate cancer radiation therapy journey. 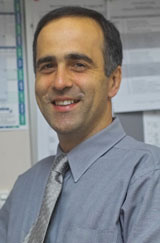 He is also one of the National Leaders in Prostate Cancer treatment. He has been influential in the creation of National Radiation Therapy Guidelines for prostate cancer and prostate bed (after surgical removal of the prostate gland) cancer treatment. Additionally while A/Prof Kneebone continues to provide personalised care to his Prostate Cancer patients, he is also the Director of Registrar Training at Northern Sydney Cancer Centre. This role enables him to pass on his years of experience and knowledge in both technical prostate cancer treatment and development, and in the important personalised patient care. He is also attached to the University of Sydney and regularly lectures at the University. Research is another strong interest to A/Prof Kneebone which allows him to maintain his position as a leader in Prostate Cancer Radiation Therapy Treatments. He is an author on numerous peer-reviewed and published articles, and has in particular published results on Prostate Cancer outcomes.